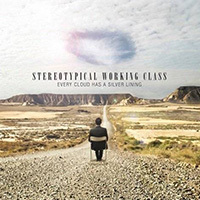 Stereotypical Working Class is an alternative rock band that hails from Lyon, France. On their Facebook page they are classified as Loud Rock. Their 2014, 14 track release, Every Cloud has a Silver Lining is definitely a lean towards the alternative side of things rather than Metal. It has songs like "Soon Enough" featuring a ton of ferocious, punk like riffs and chord progression. With their edgy, alternative style it's hard to believe that Stereotypical Working Class originates from Europe. Their sound is incredibly American with grungy chords, a mix of melodic, vicious guitar work and a pop punk voice to go with it. Throughout the album you get reminded by bands such as Billy Talent and occasionally, Mudvyane. Tracks like "Song for Kepler" have a seriously dark tone to them with patchy riffs overlapping gritty, and deep base lines. Ultimately, this release is not your typical metal album. It's definitely got elements of grunge, nu metal and grind metal. But as said earlier, the anger of punk in their music is more evident. Their sound widens their potential audience because the diversity on the album. However, while this is not a terrible album there is not a lot of variety in terms of song structure and for that reason it the album listening experience can become uninteresting at times.